Get more done, with less. 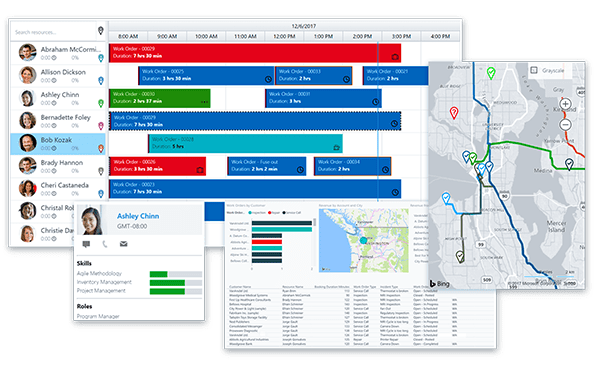 Dynamics 365 for Field Service leverages the power of predictive analytics to move from a reactive to a proactive service model. Optimise scheduling and allocate resources quickly. 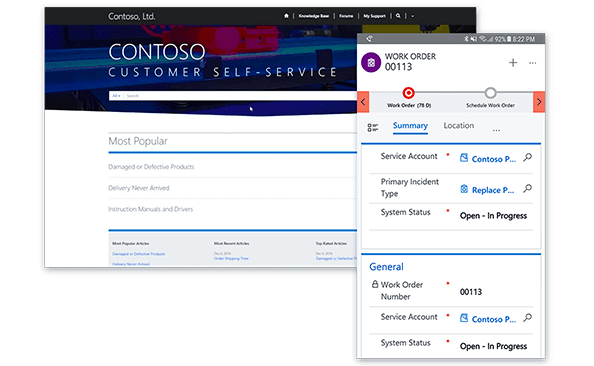 Dynamics 365 for Field Service is a complete Field Service management solution that enhances technician productivity, reduces operational costs, and increases customer satisfaction and loyalty. Field Service provides the tools to easily manage all service agreements – including recurring service calls and contracts, installed products, and warranties – across customers and locations. Technicians have access to real-time customer information and guidance, anytime, anywhere, on any device. Boost first-time fix rates by automatically dispatching the right resources. Give dispatchers efficient tools to manage resource assignments across multiple work orders. Offer leading-edge technologies such as HoloLens mixed reality headsets to provide remote maintenance, anywhere, at any time. 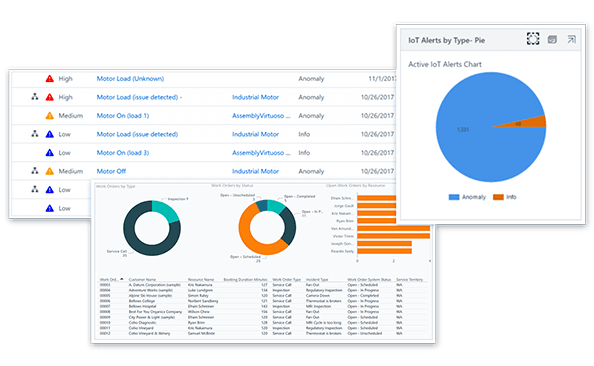 Apply predictive analysis to data from IoT devices and sensors and generate work orders automatically. Detect, troubleshoot and resolve issues remotely, before customers even know about them. Implement just-in-time predictive maintenance plans and clean, repair, or replace parts only when necessary. Increase trust by making quote, contract, and scheduling information transparent and accessible. Keep customers fully informed during every interaction through a self-service customer portal. Communicate proactively through automated appointment reminders and real-time technician location tracking. Automate processes across Dynamics 365 applications and third-party systems through an extensible and flexible platform. The choice of deployment options gives you the flexibility to start on one scenario and change later. From full cloud to cloud + edge to local business data, you can move in either direction depending on your organisation’s business needs. Run business processes on-premises, with local transactions and data storage, without replication of any business data to the Microsoft cloud. You have the choice to turn ON or turn OFF cloud synchronisation of business data. If cloud synchronisation is turned OFF, no business data leaves the trustee’s boundaries. For this deployment scenario, the application servers and SQL database will run in your own (or partner hosted) data centre. Gives you complete control when your mission-critical business processes need uninterrupted execution. Cloud + edge combines a central cloud node with local application services and business data that is stored locally. The cloud connection ensures a single view of the business across the local instances and offers embedded Power BI, intelligent analytics and machine learning in business processes. The cloud instance also provides the local installation with data failover in Azure, automated deployment and continuous updates. Take full advantage of the power of Microsoft Azure cloud with embedded Power BI, intelligent analytics and machine learning in business processes. Azure cloud is the industry leader in compliance, security and privacy. Your organisation retains complete ownership and control of your data at all times. A survey asked 6,700 enterprise decision-makers worldwide about their ERP purchasing intentions. More than half chose Microsoft Dynamics as their preferred next investment. Source: ICT Enterprise Insights 2013, Ovum Research. Companies earning $50m to $1bn. Companies earning $1bn or more. Research by Panorama Consulting identified Microsoft Dynamics as the Tier 1 ERP solution with the lowest total cost of ownership. Source: Clash of the Titans 2016, Panorama Consulting Solutions. In the manufacturing industry Microsoft Dynamics has greater market share than other Tier 1 ERP vendors. Source: The 2015 Manufacturing ERP Report, Panorama Consulting Solutions. 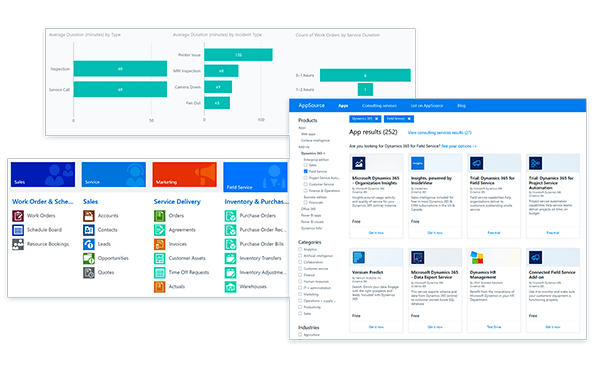 If you're considering Microsoft Dynamics 365 for Field Service, or just want more information, we're happy to answer all your questions.